Lightning storms go on and on. Frost on the window in summer. Big change, moving from Chicago after Mom’s death to the small Arizona town where Dad grew up. So many weird things are happening here – of course the twins and their new friends are going to investigate! Can you escape sorrow by moving to a new place? Book info: The Year of Lightning (The Time Shift Trilogy. book 1) / Ryan Dalton. Jolly Fish Press/North Star Editions, 2016. [author site] [publisher site] Review copy and cover image courtesy of the publisher. My book talk: When Malcolm sees someone in an abandoned house which has no doors, the fifteen-year-old and his twin Valentine uncover a dangerous force that imperils their small town – lightning can strike much more than twice in the same place! New to grandmother’s old house, new to Dad’s old high school, the twins start making friends as Malcolm dives into history and Valentine impresses her science teacher. But Patrick disappears right after Fred’s back-to-school party, so school newspaper editor Winter gets everyone investigating, as the lightning storms get more and more intense. Is the lightning striking the abandoned house or coming from it? Why must the strange watch found there stay with Malcolm constantly? Who’s the shadowed man lurking around town now? The teens and longtime town residents must hurry to find out what’s going on in that house and with the watch that won’t keep normal time before it’s too late! (first in Time Shift Trilogy). First day at her new high school! Andie is starting her senior year at Punxsutawney High (yep, same town as the famous groundhog), so sure that Colton will continue their summer movie-theater flirtation, but no. Movie-obsessed Mom named her for the “Pretty in Pink” redhead, but Andie’s life has turned into “Groundhog Day” as she awakens the next morning and the next and the next… for the first day of school, over and over again! Maybe Mom’s wish for Andie’s first kiss to be with her true love has something to do with it….hmmm. Published last week, just in time for Punxsutawney’s annual moment in the weather world’s spotlight! If you had the chance to repeat a day and only you knew it, what would you change? Book info: Pretty in Punxsutawney / Laurie Boyle Crompton. Blink Young Adult Books, 2019. [author Facebook] [publisher site] Review copy and cover image courtesy of the publisher. My book talk: Repeating her first day of school over and over, Andie realizes that only her true love’s kiss will break her out of this “Groundhog Day” loop, but as a new senior at Punxsutawney High, she finds cliques that shut out others and her summer crush taken! Andie is certain that cute Colton is attracted to her during their summer at the movie theater, but as soon as he starts showing her around the school, Kaia moves in. Waking up the next morning to her parents urging her to get ready for the first day of school, Andie tries a different outfit, a different way to stay around Colton, but same results. Repeat, repeat – try to be a cheerleader, a goth kid, on yearbook staff, but Kaia still gets Colton. When Andie realizes who she really cares for and that her classmates have lots in common if they could see past clique labels (thank you, “Breakfast Club”! ), she uses everything she’s learned throughout these many, many do-over days to make it happen. But how will someone fall in love with her – in just one day? Hope’s photographic memory is no fluke, but an essential part of her heritage as a Viator time traveler. And she’ll need it to complement her hasty training in knife-fighting and proper lady’s behavior before the team’s one-shot trip to 12th century England. When Outlander author Diana Gabaldon praises a time travel book, you know it’s something special. Read the first few chapters here courtesy of the publisher, and you’ll be hooked on Hope’s story – past and present. The sequel is due in May 2017, so start your journey Into the Dim now…. If you could travel into the past, where/when would you go? Book info: Into the Dim / Janet B. Taylor. Houghton Mifflin Harcourt, 2016. [author site] [publisher site] Review copy and cover image courtesy of the publisher. My book talk: Hope is relieved to discover that Mom didn’t die in that earthquake, startled to learn that her mother is trapped in the 12th century, and completely unprepared to time-travel back to Eleanor of Aquitaine’s court to rescue her! After Mom is declared dead in an earthquake, her adoptive dad’s family in Arkansas wants to ‘stop this homeschool nonsense’ that allows Hope to edge past her crippling phobias and harness her photographic memory. Luckily, her never-met Aunt Lucinda invites Hope to Scotland, where the teen learns of her Viator lineage which enables her aunt and others to travel – carefully, very carefully – back in time, as her mother did. But Mom missed the rendezvous and is stranded in the time of King Henry II. Ley lines, costumes, computers, training in martial arts, languages, and customs – all necessary to make that single trip back to a certain time and place. One chance per Viator, that’s it. Can Hope master enough skills to pass as a young lady traveling with chaperone? What does handsome neighbor Bran Cameron suspect about her aunt and the Viators? Why did Mom bolt back into time without telling her? Traveling back in time to film the world’s most important events as they happen, a jump goes wrong so Danny heads to ancient Samarkand to rescue Corbin, only to encounter an armored motor defense! Ask for this September release at your local library or independent bookstore – because today is National Comic Book Day! No surprise that this mile-a-minute adventure has already been optioned for a movie deal. So, if you had a time travel suit, where would you go? 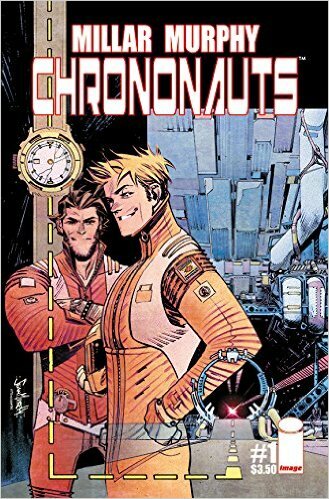 Book info: Chrononauts / Mark Millar; art by Sean Murphy. Image Comics, 2015. [author site] [artist site] [publisher site] Review copy and cover image courtesy of the publisher. My book talk: Their time-travel suits can take them back to film important world events, but two science genius buddies find it impossible to remain mere bystanders in history. Corbin’s marriage and family both lost out to his obsession with inventing the chronosuits, while Danny’s womanizing leaves few who’ll weep if he doesn’t make it back from time-traveling. Transmitting live video of landmark historical events proves the chronosuits’ worth so when Corbin’s signal is lost, his best friend jumps back to rescue him in 11th century Samarkand, right into a skirmish between motorized forces! Without the cameras on them, Drs. Quinn and Reilly have some fun with places and persons, knowing that they can time-walk away when the going gets rough. But they have left behind family issues – and bosses waiting for marketable history footage – in their own present-day. Will these smart guys use their time-suits to repair the broken relationships in their personal pasts or get greedy helping themselves to the riches and experiences of every civilization before now? Wait, what about the consequences of changing history – for everyone stuck in the present!? The first four issues of the epic webcomic are published together now to give the full arc of this time-hopping buddy adventure in a single volume. Every choice creates a parallel world. Nothing can destroy these echo worlds. 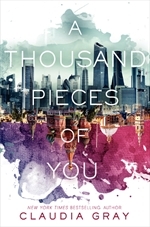 Del has the talent to Walk between worlds, but when an echo of popular Simon actually notices her, she ignores safety protocols and Walks from echo to echo until she finds a Simon who adores her. Then the trouble really begins! 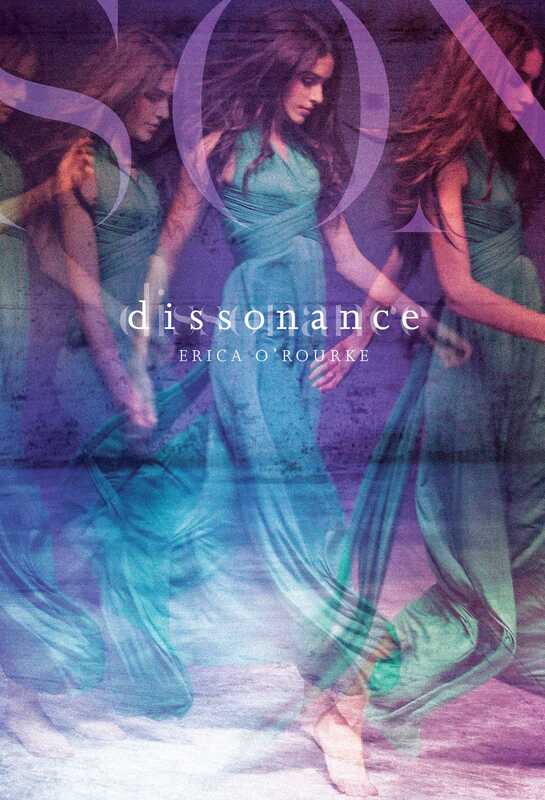 Book info: Dissonance (Dissonance, book 1) / Erica O’Rourke. Simon & Schuster Books for Young Readers, 2014. [author site] [publisher site] Review copy and cover image courtesy of the publisher. My book talk: Following the family talent of world-walking, Del ventures far beyond what her apprenticeship allows, searching for love in the parallel worlds created by every choice and endangering our Key world with what she discovers! Having older sister Addie supervise her final practice Walks instead of Mom or Dad or even ditzy Grandpa Monty doesn’t suit the Chicago teen, so musical Delaney explores on her own – entering the pivot where a choice split that echo away from the Key world, listening for an echo world’s specific frequency, leaving a tiny origami star in each world as a breadcrumb trail home, just in case. When Del interacts too much with an echo, creating a dissonance in that world that the Consort of Walkers will need to erase, she saves them the trouble by doing it herself, with scary results. Now forbidden by the Consort to Walk alone, stuck on a music class project with standoffish Simon yet aching to return to echo Simon who cares for her, Del only dares to Walk when Grandpa leaves the Key world to continue his search across echos for Grandma, an experienced Walker who never returned home. Why can’t they just tune a dissonance instead of erasing an echo world? Can she Walk and make a teensy change to fix something in the Key world? Will the real Simon ever love Del?